The site was launched by Nelson and Legend Films in 2006 and is based in San Diego. In 2012, RiffTrax was purchased from Legend by Michael J. Nelson, Kevin Murphy, Bill Corbett and RiffTrax CEO David G. Martin. As of December 2014, RiffTrax had 13 employees. The movies chosen for Mystery Science Theater 3000 were predominantly low-budget B-movies because the show itself was low budget and producers could only afford films that had either its copyright expired or that had otherwise cheap licenses. The idea of RiffTrax came about after Mystery Science Theater 3000 was canceled and Nelson had researched and consulted a lawyer about the possibility of directly releasing DVDs of films with the commentaries included. But Nelson realized this initial idea was not feasible since he would be "sued out of existence." Instead, the best way to distribute the commentaries would be to sell them independently of the films, to avoid having to obtain the rights to distribute the movies themselves. There would be no legal or monetary restrictions to prevent Nelson from producing them, though viewers would have to provide the movies themselves. The early RiffTrax were almost all solo efforts on Mike's part, but it soon became apparent that there was a strong demand for them, and Nelson was quickly able to recruit more riffers for the project. 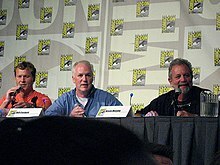 Most official RiffTrax (not counting fan-made iRiffs and the spin-off RiffTrax Presents series) have a stable cast of Mike and former Mystery Science Theater 3000 co-stars Kevin Murphy and Bill Corbett, a line-up that is identical to that of The Film Crew and the last three seasons of MST3K. That said, the guest slots vary often; other MST3K alumni have been featured, such as Mary Jo Pehl and Bridget Nelson, in addition to Internet personalities Richard Kyanka (of Something Awful fame), Josh Fruhlinger (writer of The Comics Curmudgeon) and Chad Vader, as well as actors Neil Patrick Harris, Fred Willard, and Joel McHale, and parodist "Weird Al" Yankovic. Nelson has said that he would like to bring in other guests. The enthusiasm of guest riffers for the project led to the establishment of RiffTrax Presents, a series of tracks exclusively hosted by guest riffers and sanctioned by Nelson. The success of the guest format is such that "Three Riffer Editions" of some films previously solo riffed by Mike have been produced for the VOD service, which feature new riffs by Mike in conjunction with Murphy and Corbett, and Mike has ceased producing solo riffs since 2007. Most recent works created by Rifftrax are crafted by a small team of writers; longer works are divided into 20 to 30 minute sections for each writer to rewatch and develop riffs for before assembling the entire work. Rifftrax continues to release audio track riffs that can be used to play over the owner's own copy of a film as well as making versions friendly for films offered on online streaming services like Netflix. They have also since expanded to produce full length video-on-demand riffs for films that have entered the public domain or otherwise have been licensed cheaply, such as Night of the Living Dead and Santa Claus Conquers the Martians. In 2008, RiffTrax launched iRiffs, which allows fans to upload commentaries to be sold on the website. iRiffs users are paid 50% of the net revenue generated by their products. iRiffs differentiates from normal RiffTrax in that both serious and humorous commentaries can be uploaded. In February 2009, a contest was held by RiffTrax, in which a winning iRiffs user would be given $1,000 and a chance to develop a RiffTrax Presents title, receiving instruction and critique from Nelson, Murphy and Corbett. The winners of the contest were Doug Walker, Rob Walker and Brian Heinz of That Guy with the Glasses, who contributed an iRiff of The Lion King. The RiffTrax commentary they produced was for Batman Forever. In October 2015, Rifftrax negotiated the rights to release available Mystery Science Theater 3000 episodes through Vimeo via an all-access subscription plan, with a new re-release uploaded each Monday; individual episodes could also be rented through the site, and in November 2015, RiffTrax also started to sell Mystery Science Theater 3000 episodes on their website. The RiffTrax.com releases contain a newly recorded introduction on each episode by either Michael J. Nelson, Bill Corbett, Kevin Murphy, or Bridget Nelson and Mary Jo Pehl. A substantial percentage from the episode sales on the RiffTrax website goes to the cast members of MST3K. On July 20, 2018, RiffTrax celebrated its twelfth anniversary. As part of SF Sketchfest in San Francisco, California, Nelson, Murphy, and Corbett have appeared several times performing live riffs alongside a screening of a film. As of 2008, they have appeared three times, having riffed Daredevil and Over the Top in 2007 and Plan 9 from Outer Space in 2008, the last being shown in the historic Castro Theater. The RiffTrax crew have done live internet broadcasts on Ustream.tv, riffing public domain films and taking viewer questions. RiffTrax has teamed with NCM Fathom Events to host special one-night live RiffTrax events. Nelson, Corbett, and Murphy, along with special guests, perform their riffing to a live audience in one theater, which is simultaneously broadcast live to select theaters around the country, except in the Pacific Time zone, where a replay of the broadcast is shown. The first show was performed live at the Belcourt Theatre in Nashville, Tennessee on August 20, 2009, where Mike, Kevin, and Bill riffed Plan 9 from Outer Space, along with the short film Flying Stewardess and guest appearances by Veronica Belmont, Jonathan Coulton, and Rich Kyanka of Something Awful. An encore showing was shown on October 8 of that year. The second RiffTrax Live! show in theaters took place on December 16, 2009, where they riffed several Christmas short films, one featuring special guest Weird Al Yankovic. An encore showing was shown in theaters the next day. The third RiffTrax Live! show took place on August 19, 2010, with the trio riffing the cult classic Reefer Madness (its encore showing took place on August 24). A fourth live show riffing House on Haunted Hill, also filmed at the Belcourt, occurred on October 28, 2010, with special guest Paul F. Tompkins. A fifth took place on August 17, 2011, featuring the film Jack the Giant Killer. A sixth took place on August 16, 2012, featuring the film, Manos, The Hands of Fate. A seventh live event took place on October 25, 2012, featuring Birdemic: Shock and Terror. The live event featuring Starship Troopers took place on August 15, 2013. The ninth live event featuring Night of the Living Dead was performed on October 24, 2013 . On February 25, 2013, RiffTrax announced a Kickstarter campaign to raise money to secure the rights to riff Twilight, the first film of The Twilight Saga, for their live show in August 2013. Although the Kickstarter was successful, RiffTrax could not work a deal to secure the rights to Twilight and they, instead, used the funding to secure Starship Troopers. On May 12, 2014, RiffTrax announced another Kickstarter campaign to raise money to secure the rights to the 1998 version of Godzilla. The Kickstarter raised the goal of $100,000 within a day. On May 29, they announced a stretch goal of $250,000 to secure the rights to Anaconda for their Halloween show; the goal was reached on June 10, the day before the Kickstarter's end. For 2015, RiffTrax repeated the Kickstarter approach, successfully funding its four-movie event for the year, dubbed "The Crappening". The successful Kickstarter allowed them to riff on The Room, Sharknado 2: The Second One, Miami Connection, and Santa and the Ice Cream Bunny at different live events throughout the year. The Rifftrax riff of The Room will also be performed live during the 2015 Tribeca Film Festival's series of midnight special events. For 2016, RiffTrax used a Kickstarter campaign to successfully fund their events for the year, meeting their initial goal of $225,000 within four days after the start of the campaign, with $620,999 as the total amount raised. The first event was a riffing of the film Time Chasers on May 5, 2016 and used a high definition remaster of the film provided by its director, David Giancola. The second event was a Mystery Science Theater 3000 cast member reunion on June 28, 2016, and took place in Minneapolis, Minnesota. The format of the reunion was similar to RiffTrax's SF Sketchfest "Night of the Shorts" shows, using various educational shorts as riffing material. Alongside Nelson, Corbett, and Murphy, the guests were fellow MST3K cast members Joel Hodgson, Bridget Nelson, Mary Jo Pehl, Trace Beaulieu, Frank Conniff, and Jonah Ray. The third event for 2016 was Toho's 1961 Kaiju classic Mothra on August 18, 2016 and featured a brand new widescreen print. The fourth RiffTrax event was the horror classic Carnival of Souls and took place on October 27, 2016. The print used was the 78 minute colorized version of the film previously released on DVD by Legend Films. For 2017, RiffTrax again used a Kickstarter campaign to successfully fund their events for the year, meeting their initial goal of $250,000 on March 8, 2017, sixteen days into the Kickstarter campaign. The first event was a new riff of Samurai Cop, on April 13, 2017. The second event was the "Summer Shorts Beach Party" on June 15, 2017. The format of the show was similar to the shorts shows from the SF Sketchfest "Night of the Shorts" and the MST3K Reunion Show. Alongside Nelson, Corbett, and Murphy, the guest riffers were Bridget Nelson, Mary Jo Pehl, Trace Beaulieu, Frank Conniff, and Paul F. Tompkins. The third event was the Doctor Who special The Five Doctors, held on August 17, 2017; which, for legal reasons, RiffTrax could not reveal this until the RiffTrax Kickstarter campaign had officially ended. RiffTrax had been wanting to do a Doctor Who episode for some time as a way to bridge into its fandom, but had to get permission from the BBC. The BBC had been hesitant, fearing that the nature of RiffTrax may have been mean-spirited, but after seeing some of Rifftrax's work, agreed to the use, feeling it would help promote Doctor Who in America. August 17, 2011 Jack the Giant Killer What Is Nothing? July 9, 2015 Sharknado 2: The Second One Why Do I Need Parents? October 1, 2015 Miami Connection Measuring Man! ^ The name for this Fathom Event presentation was RiffTrax Live: Christmas Shorts-Stravaganza. ^ The name for this Fathom Event presentation was RiffTrax Live: The MST3K Reunion Show. ^ The name for this Fathom event presentation was RiffTrax Live: Summer Shorts Beach Party. In conjunction with the National Geographic Channel, Nelson, Corbett, and Murphy created a 3-part television series, "Total Riff Off" that aired on the channel on April 1, 2014 and became available to buy as video-on-demand later on the RiffTrax site. Each episode is one hour long featuring the three riffing on older National Geographic footage. According to Nelson, the idea for the series came from a National Geographic producer who was also a fan of RiffTrax. RiffTrax and National Geographic worked together to find the best footage to use. In 2015, three additional episodes of "Total Riff Off" were created (two as 2015 RiffTrax Live Kickstarter rewards), which were also later available for purchase as video-on-demand on the RiffTrax website. In August 2008, Nelson, Corbett and Murphy formed a musical trio named The Rifftones, initially to compete in Quick Stop Entertainment's second Masters of Song Fu competition. They won the competition, beating fellow musicians Jonathan Coulton, Paul and Storm and, in the final round, Jason Morris. After the competition, they decided to continue creating songs as The Rifftones, making songs based on the movies they've riffed and releasing a CD collecting them, which is available on the RiffTrax site. RiffTrax commentaries are synchronized at the start of the movie using a cue. To reassure consumers that the MP3 file is synchronized with the film, fictional character and riffer "DisembAudio" speaks occasional lines in exact synchronization with the movie. "RiffTrax Presents" commentaries feature a female synchronization voice, Debbie. Though RiffTrax are suggested to be played on an MP3 player or with computer software, they are sold as unrestricted MP3s, allowing users to choose the viewing method that suits them the best. A RiffTrax Player is also offered as a free download for Windows computers. The movies chosen for RiffTrax are based on two criteria: whether the movie lends itself towards a funny riffing, and whether the film is widely available on DVD. These criteria have resulted in a wide variety of genre and era of movies chosen to be riffed. The first audio commentary made available through the web site in July 2006 was for the 1989 film Road House, long cited by Nelson as the cheesiest movie ever made. The RiffTrax Player (RiffPlayer) is a program which automatically synchronizes the commentary playback to the DVD playback. The RiffTrax Player makes use of a commentary MP3 as well as a text file (.sync) containing the synchronization information of the DVD and the commentary. As of February 2015[update], the RiffTrax Player currently supports Microsoft Windows and Mac OS X Snow Leopard and up. RiffTrax On Demand features downloadable DRM-free video files of films with RiffTrax commentaries embedded. RiffTrax On Demand has released many short, public domain, and educational films similar to the ones that MST3K would sometimes mock before a full-length movie began. ^ "Small Business Saturday!". RiffTrax. November 29, 2014. Retrieved April 27, 2015. ^ Penny, Damian (2006-08-10). "Review: Rifftrax". Blogcritics Magazine. Archived from the original on 2008-01-06. ^ "Interview: Michael J. Nelson". TeeVee. 2006-10-16. Archived from the original on 2006-11-24. ^ Jurgensen, John (2006-11-18). "Everyone's a critic: DVD commentaries by fans". Wall Street Journal. p. P2. ISSN 0099-9660. ^ Kaiser, Andy (2006-08-07). "Please talk during the movie". The Grand Rapids Press. p. D3. ^ Salas, Randy (2006-08-11). "Cheeky remarks now on RiffTrax". Deseret News. p. W06. ISSN 0745-4724. ^ "RiffTrax Presents". RiffTrax. Archived from the original on 2008-09-14. Retrieved 2008-08-20. ^ Otterson, Joe (June 28, 2016). "'Mystery Science Theater 3000' Reunion: Kevin Murphy Talks Show's Weirdest Fans". The Wrap. Retrieved June 29, 2016. ^ "iRiffs FAQ". RiffTrax. Retrieved 18 November 2008. ^ Legend Films, Inc. (February 4, 2009). "RiffTrax Announces Chance for Fans to Work with the Stars of Mystery Science Theater 3000". PR.com. Retrieved 28 February 2009. ^ Walker, Doug (March 19, 2009). "Rifftrax Winner!". That Guy with the Glasses. Retrieved 2009-03-19. ^ Reich, J.E. (November 3, 2015). "RiffTrax Is Releasing Episodes of Cult Favorite 'Mystery Science Theater 3000'". Tech Times. Retrieved November 9, 2015. ^ torgosPizza (May 20, 2007). "RiffTrax Live! for San Francisco Sketch Fest". RiffTrax. Archived from the original on 26 July 2011. Retrieved 18 November 2008. ^ Lastowka, Conor (December 11, 2007). "RiffTrax Live in San Francisco". RiffTrax. Archived from the original on 26 July 2011. Retrieved 18 November 2008. ^ Sampo (July 24, 2009). "Update: RiffTrax Live Event to Broadcast to Theaters". Satellite News. Retrieved 25 March 2011. ^ "Mark your calendar: Next RiffTrax Live event scheduled for Aug. 19". mlive.com. Retrieved 15 June 2010. ^ "The Stars of Mystery Science Theater 3000 Give the Vincent Price Classic House on Haunted Hill the RiffTrax Treatment on the Big Screen This Halloween". BusinessWire. October 5, 2010. Retrieved 25 March 2011. ^ Sloan, Will (16 August 2012). "'You Can't Just Be The Voice Of Generic Sarcasm": The Art of Movie Riffing". Retrieved 17 August 2012. ^ "RiffTrax Live: BIRDEMIC". Fathom. Archived from the original on 23 August 2012. Retrieved 17 August 2012. ^ "RiffTrax Live: Starship Troopers". Fathom. Retrieved 15 August 2013. ^ "RiffTrax Live: Night of the Living Dead". Fathom. Retrieved 29 October 2013. ^ "RiffTrax Wants to Riff TWILIGHT Live in Theaters Nationwide! by RiffTrax: Mike, Bill & Kevin — Kickstarter". Retrieved 25 February 2013. ^ "Major Announcement - We Have a Title!". Kickstarter. May 22, 2013. Retrieved April 27, 2015. ^ "RiffTrax will Riff GODZILLA & ANACONDA in Cinemas Nationwide by RiffTrax: Mike, Bill & Kevin - Kickstarter". Retrieved 13 June 2013. ^ "ANACONDA Stretch Goal!". Retrieved 13 June 2013. ^ "ANACONDA is Happening!". Retrieved 13 June 2013. ^ Jasper, Gavin (2015-02-19). "RiffTrax Live 2015 Schedule Announced: The Crappening". Den of Geek. Retrieved 2015-02-25. ^ "Here are the films in 2015 tribeca film festival midnight section". Tribeca Film Festival. 5 March 2015. Retrieved 5 March 2015. ^ "RiffTrax Live 2016: MST3K Reunion, Time Chasers Live & More!". Kickstarter. 7 March 2016. Retrieved 7 March 2016. ^ Hughes, William (March 9, 2016). "Get Involved, Internet: RiffTrax is putting together an MST3K reunion show". The A.V. Club. Retrieved March 23, 2016. ^ Gilyadov, Alex (March 27, 2017). "Rifftrax Live Brings the Classic Doctor Who Tale The Five Doctors to the Big Screen". IGN. Retrieved March 27, 2017. ^ "RiffTrax Live '17: Samurai Cop, Beach Party & Mystery Title!". Kickstarter. 21 February 2017. Retrieved 25 February 2016. ^ "RiffTrax Live '17: Samurai Cop, Beach Party & Mystery Title! by RiffTrax: Mike, Bill & Kevin — Kickstarter". Kickstarter.com. 2017-03-08. Retrieved 2017-03-19. ^ Anderson, Kyle (August 10, 2017). "THE RIFFTRAX GUYS DISCUSS TACKLING A DOCTOR WHO CLASSIC". The Nerdist. Retrieved August 18, 2017. ^ Jasper, Gavin (August 20, 2018). "A Complete History of RiffTrax Live". Den of Geek. Retrieved August 23, 2018. ^ Cooper, Gale Fashingbauer (2014-03-19). "No joke: Former 'Mystery Science' riffers get April Fool's Day special". The Today Show. Retrieved 2014-03-19. ^ Stamato, Philip (2014-04-02). "Talking to Mike Nelson About RiffTrax's National Geographic TV Special". Splitsider. Retrieved 2014-04-02. ^ a b "RiffTrax FAQ". RiffTrax. Archived from the original on 2008-01-21. ^ "Mystery Science Theater, round two". The Commonwealth Times. 2007-02-08. ^ a b "Mike Nelson Interview". Buzzgrinder. 2006-10-14. Archived from the original on 2006-12-06. ^ Murphy, Kevin; Corbett, Bill (May 13, 2008). RiffTrax Presents: Saw. RiffTrax. Retrieved 2008-05-14. ^ "RiffTrax Player". RiffTrax. Archived from the original on December 13, 2007. Retrieved 2007-11-10. ^ "'Road House' -- it's the cheesiest, book says". CNN.com. August 16, 2000. Archived from the original on August 13, 2007. Retrieved April 28, 2015. ^ "On Demand Catalogue". RiffTrax. Archived from the original on December 13, 2007. Retrieved 2007-12-21.